Contrary to widespread expectation, emerging market debt renegotiations in the era of bond finance have generally been quick and involved little litigation. This paper presents a model that rationalizes some of the initial fears and offers two interpretations for why they did not come true. First, when debt exchange offers are sufficiently attractive relative to the risk faced by holdouts, full participation can be an equilibrium. Second, legal innovations such as minimum participation thresholds and defensive exit consents helped coordinate creditors and avoid litigation. In this regard, exit consents are shown to have similar effects on creditor coordination as collective action clauses (CACs). Unlike CACs, exit consents can be exploited to force a high haircut on creditors, but the ability of creditors to coordinate to block exit consents limits overly aggressive use. *Ran Bi is an Economist at the International Monetary Fund. Marcos Chamon is a Deputy Division Chief at the International Monetary Fund. Jeromin Zettelmeyer is the Director-General for Economic Policy in the German Ministry for Economic Affairs. Prior to that, he held positions at the EBRD and the IMF. The authors are grateful to Charles Blitzer, Nicola Gennaioli, Yannick Kalantzis, Thomas Laryea, Michael Waibel, and seminar participants at the IMF, at the Berlin Conference on Sovereign Debt and Default, the Banque de France/Sciences Po/CEPR Conference on the Economics of Sovereign Debt and Default, and at the Eigth Annual Workshop of the CEPR Working Group on Macroeconomics of Global Interdependence for helpful comments. Supplementary material is available for this article at 10.1057/imfer.2016.13 and is accessible for authorized users. Supplementary material, approximately 3 KB. Note that while 1−p may be a corner solution for V2, it would never be the global optimal since by offering (1−p)− the country could move to the previous range where full acceptance was an equilibrium, and improve its welfare. Note that unless Open image in new window binds, the country would be better-off offering Open image in new window , and moving to the previous range (where it solves V2). International Monetary Fund (IMF). 2002, The Design of the Sovereign Debt Restructuring Mechanism—Further Considerations. International Monetary Fund, Washington DC. Available online at www.imf.org/external/np/pdr/sdrm/2002/112702.htm. International Monetary Fund (IMF). 2003a, Proposed Features of a Sovereign Debt Restructuring Mechanism. International Monetary Fund, Washington DC. 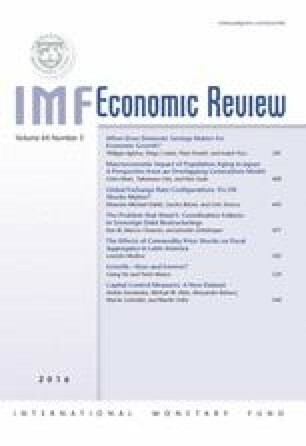 Available online at www.imf.org/external/np/pdr/sdrm/2003/021203.pdf. International Monetary Fund (IMF). 2003b, Reviewing the Process for Sovereign Debt Restructuring within the Existing Legal Framework. International Monetary Fund, Washington DC. Available online at www.imf.org/external/np/pdr/sdrm/2003/080103.htm. International Monetary Fund (IMF). 2003c, Uruguay 2003 Article IV Consultation and Third Review Under the Stand-By Arrangement, available via the internet: www.imf.org/external/pubs/ft/scr/2003/cr03247.pdf. International Monetary Fund (IMF). 2014, Strengthening the Contractual Framework to Address Collective Action Problems in Sovereign Debt Restructuring, available via the internet: www.imf.org/external/np/pp/eng/2014/090214.pdf. Sachs, Jeffrey, 1995, Do We Need an International Lender of Last Resort? Frank D. Graham Lecture (Princeton, NJ, April). Unpublished paper: Available online at www.earthinstitute.columbia.edu. Taylor, John, 2002, “Sovereign Debt Restructuring: A U.S. Perspective.” Remarks at the Conference “Sovereign Debt Workouts: Hopes and Hazards?” Institute for International Economics, Washington DC. Available online at www.treas.gov/press/releases/po2056.htm.